An impending financial crisis may increase the rate of adoption and use of a cryptocurrency by the masses, and this could potentially tilt in favour of proponents of the new digital currency market. An economic downturn may be near, as big banks interpret the current yield curve data and conclude a recessionary forecast. This significant data reveals a consistent dip from 2008 to 2018 and this downside trend could lead to a coming economic crisis. Against this drastic prediction, the emerging cryptocurrency market could be in a delicate, but promising position. This crisis may cause the potential use of digital currency as a medium of exchange, as a payment gateway, and as a store of value that may actuate digital currency into the mainstream. Firstly, the yield curve plots the difference between interest rates on short-term and long-term government bonds and the more extended period for an investment, the better its yield. 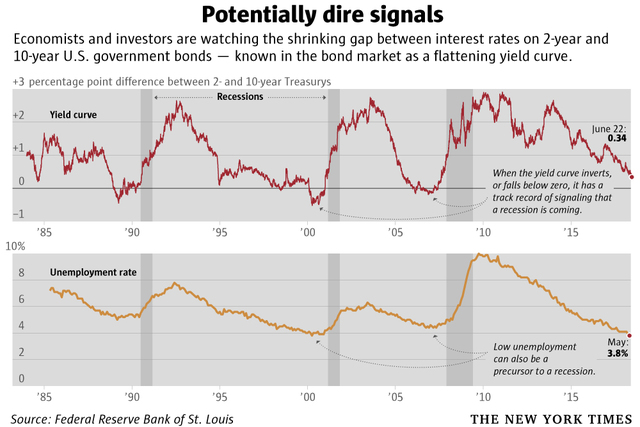 So long as there is a significant gap between the short and long-term interest rates, the yield curve will slope up. An upward trajectory is a normal condition of an economy. At the current time, the long-term investment rates do not rise, and the curve begins to taper out, partly due to the increased of short-term yields by the US Federal Reserve bank. A flat yield curve is considered to be a precursor of an impending financial crisis. When a long-term rates decline as they currently are, they will eventually drop below short-term yields, causing the curve to invert and the last instance was in the middle of 2007. Secondly, the traditional financial markets have underperformed, with the first half year of 2018 recorded as the worst since 2010. The primary driver of this cause maybe the stock prices in most countries are dropping, and China’s shares have fallen by 30% since the January 2018 level. Another reason for this underperform the trade wars between several states, enumerating to the market stress. In 2008, the US government bailed out several banks that went bankrupt. This distrust in the financial system may force the masses to find an alternative means to control their economic future by embracing digital currency. Bitcoin was an epitome of financial freedom by Satoshi Nakamoto as a hedge against financial crises. The first block mined on the Bitcoin blockchain, termed as the genesis block, included this text, “The Times 03/Jan/2009 Chancellor on the brink of the second bailout for banks.” This text on the bailout was meaningful because the first few transactions on the network were carried out before Bitcoin was publicly released and this reference to a bank bailout supported his idea of Bitcoin’s development to solve the instability of the world’s economy. A decentralized blockchain supports digital money and is outside the control of governments and central banks. In a financial crisis, the masses could turn to a blockchain technology-based alternative to safeguard their wealth. While the central government can always print more money, digital money depends on supply and demand of the market and are free from government oversight or intervention. A declining economy could spur cryptocurrencies uses against fiat for payments and savings. In countries where the government debased the national currency or tried to restrict citizens’ access to their money, these citizens flocked to cryptocurrency to protect their value from hyperinflation. There is no reason to assume that others around the world would not act when they face those circumstances. Cryptocurrencies have many uses besides a store of value. There are hundreds of digital currency and blockchain projects in development to transform virtually every industry. Cryptocurrency will succeed when it becomes an everyday transactional medium of exchange. Cryptocurrency will become a stable investment with participation from institutions’ investments and retail companies accepting digital money payments. For all the commercial and institutional interest in the digital currency, it is the perception of the masses in the street who will spur broad cryptocurrency acceptance to universal usage; therefore the general market will need to embrace digitization.